As I started on the 2nd half of the marathon, I really felt completely comfortable, and happy with my pacing. However, the voices in the back of my head said “you should still be feeling good at this point, only halfway”, and I also reminded myself that I still had the hard half to go, and so could take nothing for granted. Would still just focus on taking it slow, and conserving energy for the late stages where I would need it. The Queens portion of the course is very short. In my first few NYC marathons, it was also pretty sparsely populated with spectators, but that has changed in recent years. Now there are lots of people watching, and making lots of noise. I never liked how the course seemed very jig-jaggy through Queens, with lots of turns. However, they made some subtle changes this year to reduce some of the turns and straighten things out. I think this makes the Queens portion of the course slightly shorter, which is made up with a little extra room in the Bronx. I can only otherwise say that I was feeling good here, and got lost a bit in the support of the crowd. Mile 14 was completed in 10:09, and before I knew it, we were approaching the Queensboro Bridge. At that stage of the race, the bridge is a killer. I firmly believe that charging hard up the bridge last year was my downfall in missing 4:30. So this year, I decided to just take it easy up the bridge and incorporate walk breaks. I walked early on up the bridge for about 2 minutes, and then again as we reached the top. This is actually where I started feeling my first muscle issues, namely spasms in my hamstrings. It was not bad, but just the first cause of concern. Seemed related to the cold wind, which could be felt here as a cross breeze from right to left. It went away as soon as we were off the bridge. In addition to dealing with the incline is the challenge of dealing with the congestion. You essentially have 2 lanes of traffic for running, but with lots of people walking, (sometimes 3 and 4 abreast) there is a lot of energy lost in just weaving your way through the walkers up the hill. My approach was to try and find somebody running at my pace and just stay right behind them, and let that person pick through the crowd. I do enjoy the relative serenity of the bridge. With no people cheering, it is very quiet, and a chance to recollect before you hit the big crowds again when you come off the bridge. The cool thing I saw here, that I didn’t remember from years past, is that as we were coming down the ramp off the bridge, there were people stationed above on the main structure of the bridge, literally hanging over the concrete side, above the runners and cheering. It was a nice welcome into Manhattan, and to the 16 mile mark. Only 10.2 miles to go! At this point, was still right within my strategy as mile 15 with the uphill was 11:08, and mile 16, with some uphill in it, was 10:46. Little slower than I wanted at this point, but still no cause for concern. At this point, my time was approx 2:40, which meant I had 1:50 to cover 10.2 miles, or almost 11 minutes per mile. So, still feeling good about 4:30. At this point, we hit 1st Ave, which on TV they tend to call the “Canyon of Sound”. In my experience that is not really true. Yes, the crowds are HUGE on 1st Ave, but they are very sterile. They tend to stand around and watch, and are not so into the cheering and screaming, as they are on other parts of the course. This may be because the Ave is so wide that the spectators are set apart quite a ways from the runners. Again, I just focused on slow and smooth and enjoying the energy. I had two people to look for here. Michelle, was going to be at around 72nd St, and a work friend, CW would be in the 90’s. I didn’t know which side they would be on, so guessed left. Started looking for Michelle after 70’s St, and was able to easily pick her and her sister out from the crowd. A quick hello, high five, and an awesome picture, and I was off on my way again. As I approached 90’s St, started looking for CW. Lot of people watching here, so I was focused on the front set of watchers, and almost ran right by her, and her boyfriend as they were set back in the sidewalk. Luckily, she saw me and called out my name, and I heard, so I was able to see her, give a wave and smile, and carry on. Still feeling great through this stretch. I did not take a walk break, with the exception of the water stops. However, this is where I started getting worried, as my times were slower than my pacing felt. I was feeling good, but my miles were slowing here, in the 10:45 to 11 range, rather than the 10:30 range I felt. That was a bad sign. No only did I take it up 1st Ave without walking, but I also ran the entire length of the Willis Ave Bridge, which is also a clear first for me, and a good half of the Bronx portion without walking. Did take a walk break towards the end of the Bronx portion, but thought I did pretty well through this area. Over the Madison Ave Bridge back to Manhattan and the 21 mile mark. This is where everything changed for me. As I crossed 21 and hit the button on my watch, I simultaneously noted the really slow time of 11:47 for the mile, and first felt the twinges and muscle spasms that would haunt me the rest of the race, in my legs. It was at this moment that I knew that 4:30 was totally out of reach. Even though I was “feeling good”, my times were just way too slow. And now, in my defeated spirit, my legs started barking at me big time. The muscle spasm that I had was weird. Sort of felt it in my lower quads, almost at the top of my knees. Felt it in both legs, and it seemed to hurt regardless of whether I was running, walking, and stretching didn’t help that much. At times I was able to run through it, at times it was too much and I took significant walk breaks. The uphill stretch from 110th to 90th St before you enter the park was the worst. I walked most of this, and it resulted in my slowest mile, 14:16, for mile 24. The crowd is so loud and encouraging here, but I just couldn’t get myself together enough to make a real push. The emotions felt here were truly mixed. I was very disappointed and upset that 4:30 was not going to happen. Not only missing 4:30, but I could see that 4:35 wasn’t going to happen, and then 4:40. On the other hand, I really did feel a huge sense of accomplishment for getting as far as I did. I was going to finish the race, and I was also going to beat thousands of people also running the race. And since this will be the last NYC Marathon I will run for awhile, I tried hard to enjoy the last miles, through the most amazing park, the most amazing crowd, in the most spectacular mass participation sporting even there is. I walked through the mile 26 sign and water stop, and then started to run again, and managed to keep running to the end. It is mostly a blur, but I really did savor the very loud crowd on Central Park South, and appreciate and enjoy the final third of a mile through Columbus Circle, back into the park, and the final stretch I run hundreds of times up into the finish line. My pace was still incredibly slow (14:44 for last 1.2 miles) but I ran it, with no walking, and was happy I was able to get that done. My finishing time was 4:44:05. In the end, really not that bad. 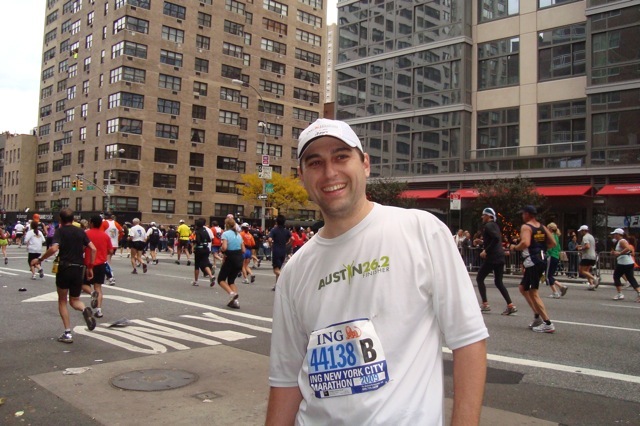 It is my 2nd fastest NYC Marathon, and my 4th fastest overall out of 11. While disappointed I didn’t get to, or close to 4:30, I was still very happy with the overall experience. Of course, then started going through the inevitable reflection of what could I have done better? A suggestion was made that taking salt in the race may help to avoid muscle cramps. I will need to experiment with that next time around. Otherwise, I don’t know there was much else I could do differently. I think the slower time was simply a reflection of not having trained well enough. I worked through several injuries in the last few months, starting with a severe lower back spasm in late July, and then shin and groin issues. I got a lot of miles in, but there were not hard, quality miles. Anyway, with the exception of the approx 50 minutes it took me to get from mile 21 to mile 25, I totally had a blast and enjoyed every other moment of the day! My tentative plans for 2010 include Rhode Races Marathon on 5/2, and possibly Chicago on 10/10. Will also mix in two triathlons, possibly a duathlon, and lots of road races and biking! Trying to get to 800 miles for 2009, but since I’ve continued to have groin issues and have put in limited miles in the last 3 weeks, it is not looking like that will happen. If I don’t make it in 2009, then it WILL happen in 2010! Yay finally Part 11 ~ great race report. I totally enjoyed reading it Scott. I was glad to be able to see you and give you a high five. I still remember how great and fresh you looked. Nice big smile too!!!! Congrats my friend!!! Hope to get in some bike riding with you next year!!! NYACK! Congrats! Fun watching your training on dailymile!